I’ve said this from the beginning: Google Plus needs the connection with search to succeed. And Bill Slawski already said it: posts and comments will start appearing in the Google Result Pages (SERPS). And they are. Some posts are now showing up in the SERPS. They are not ‘ranking like crazy’ yet and they are far from perfect and it is not every post, but they are there. Should we start optimizing? Maybe we should, at least for testing purposes. With Google losing Twitter as part of their realtime results Google+ posts are bound to become very important in Google’s social search efforts. “Shared by” will most probably be mostly filled by Google+ posts. It is interesting to look at what makes a post appear in the SERPS and after that, what makes it rank. Keep in mind, this is a personalized result, also because I am logged in to Google, and it is on a very specific search term. But the post can also be found when not logged in, so personalized here means higher rankings. Some of my friends can also see the result. Others don’t so it is not yet clear how this affects other peoples search results. The most important part: it is in there. The content in there is off course very important. Even though this post is not that long it seems obvious that there should be enough content in there to make it rank. And the content should be unique. How would Google determine which post is important and which one isn’t. My guess (a guess, so not a fact AT ALL) is that comments matter. The more comments, the more engagement and the more attention it gets, the more visible it becomes to Google. Same goes for shares on Google Plus: the more shares the more people seem to like the post, the more important it will be. Maybe the number of friends can be a metric, if not at least you have more possible friends to share or comment on your post. So is this a big deal? Well not yet, but it is a first step. If posts are in there it means that they can rank, sooner or later they will, as long as the content is right. Great Post, it seems likely to me that as with the Facebook revolution for business’s Google+ will become a HOT topic for businesses and their efforts to obtain a higher ranking, however from a business point of view it seems as there will be another channel to work with and the question will be where will it all end? I will keeping a close eye on Google+ and lets see if it is the ‘Golden Goose’ for companies struggling with their natural listing on Google SERPS. Thanks to Bas van den Beld for a great update on this. Nice find, Bas, and very interesting observation about the title! This shows they are looking at the content closely. Did you notice how long it was before this indexed and showed for this specific query? 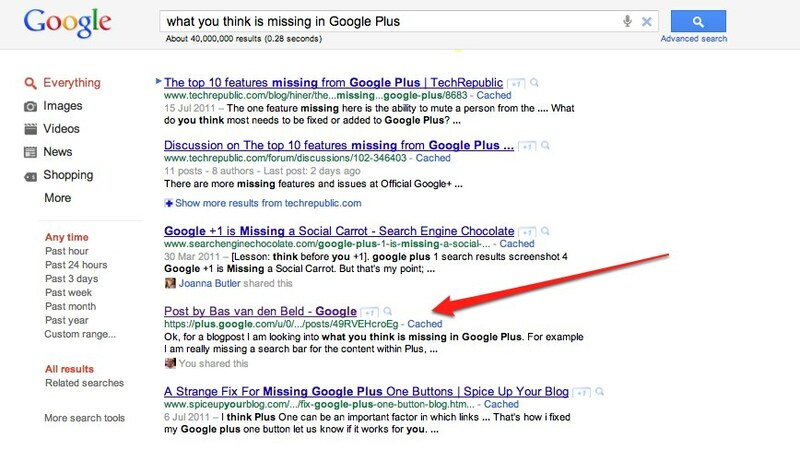 Maybe real-time search is back, or near real-time, but via Google Plus instead. I dont know how long it took to be honest, the post is from last week so the timing has to be tested out. I don’t think realtime search is back already though. Pingback: Today On Google+: Will Circles Work, Google+ And Search & Top Google+ Posts! good write-up Bas. given your interest in this area, and in how social search will evolve to truly impact core search, vs just UGC, you might want to take a look at my company, HeyStaks. we are a venture backed social search company that does exactly this, via browser apps and mobile apps. one can collaborate, yet anonymously, with peers of like minded interest, to get more personalized results. you dont have to overtly “like” or “+” something, and identity is kept anonymous. all of the sausage making re content and individual relevance and reputation in order to determine community results recommendations happens in the background. on the browser you see this content right at the top of your SERP, integrated. on the mobile, you get community recommendations, then algo results from the 3 main search sources – 1-stop search on mobile. this is bad, very bad move from Google. It will kill Google+ itself. People are more than likely to open a few accounts and spam it, or beg people to share for no reason. I like it, although it migth be an idea to have a ‘social on/off’ tab/tickbox to enable posts off Plus. When you search for posts on google, do you need to follow/encircle the person for their posts to show up? Basically will you be about to find +posts from people outside your circles? From an advertiser POV, we’re seeing this new social search field develop and it’s still somewhat revolved around content strategy -> engagement. How else can you utilize social, from Google’s perspective, for companies? Pingback: A Google Plus Primer On Links & Rank – Internet Marketing for Everyone! Very interesting, we were just playing around with Google Plus and wanted to know if the comments end up in the SERPS and your article has answered that for us. Thanks. Bas how do you find time to sleep?? However I certainly don’t mind as yet you have posted another fine article!